Richard Avedon. "Twiggy, dress by Roberto Rojas, New York," 1967. In: Avedon Fashion, 1944-2000, by Carol Squiers and Vince Aletti, p. 247. NY: Abrams, 2009. Leonard Freed. 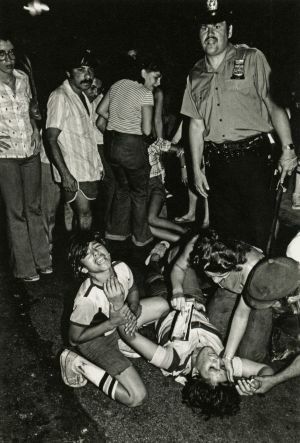 "Incident in New York City's Ninth Precinct," 1979. In: The New York Times Magazine: Photographs, edited by Kathy Ryan, p. 119. New York: Aperture, 2011. "The Nebula N 8.Sagatarii," undated. 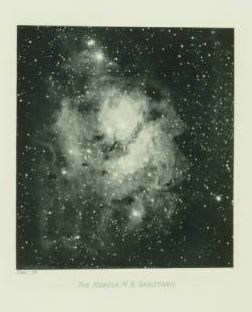 In: Heliogravure plates in Photographs of nebulae and clusters made with the Crossley reflector, James Edward Keeler, contributor, plate 56. [Sacramento : W.W. Shannon, superintendent of state printing, 1908]. Bernd and Hilla Becher. "Steubenville, Ohio, USA," 1980. 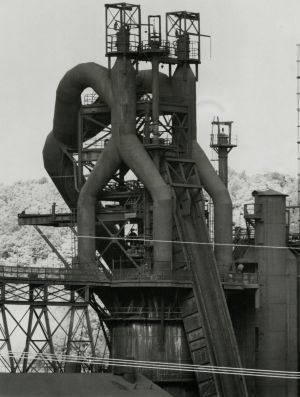 In: Blast Furnaces, by Bernd and Hilla Becher, plate 15. Cambridge, MA: The MIT Press, 1990. Lewis W. Hine. "Bibb Mill No. 1, Macon, Ga," 1909. 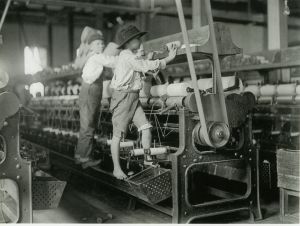 In: Lewis W. Hine: Children at Work, by Vicki Goldberg, p. 60. NY: Prestel, 1999. [Photographer unknown]. 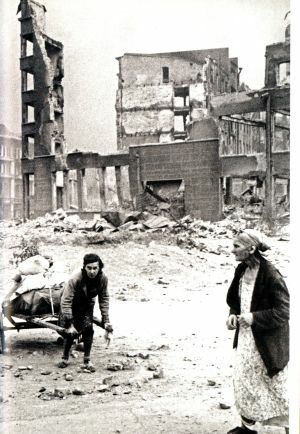 "Stalingrad," 1942. In: The Soviet Image: A Hundred Years of Photographs from Inside the TASS Archives, by Peter and Sam Radetsky, p. 137. San Francisco: Chronicle Books, 2007. Indexes about 250 alternative, radical, and leftist publications. Can be searched together with the Alternative Press Index, which covers 1990 - present. A rich source of articles on photography in the alternative press. Search to find material on the documentary uses of photography for marginalized peoples, ethical issues in photography, photography as storytelling, subversive uses of photography, and many other topics. Includes many articles on the history, impact, and uses of photography. International index to articles in fine arts journals, book reviews, and articles in museum bulletins. Covers all periods, places, and genres of art, from classical antiquity to the present. Photography as a fine art is well covered; also photography in the visual studies, material culture, and other areas of study. Coverage: 1984 - present. See Art Index Retrospective for coverage of 1929-1984. The role of photography in our world and in our society is pervasive. Photography has been used not only (or even most importantly) as an art form but also to document, to teach, to illustrate, to advertise, to persuade - among many other things. For this reason, finding articles on photographs and photography can cross virtually every disciplinary boundary, including the scientific and technical aspects of photography that cover equipment, processing techniques, and materials. Consequently, articles about the various aspects of photography can be found in many different types of databases and bibliographies and there is no one authoritative or central source for this literature. The researcher must be prepared to search in many different places. Adding to the complexity of finding periodical literature in the field of photography is the necessity to make the distinction between articles on photography, its history/theory/philosophy and processes and artistic merits, and articles that include photography in ways that are innovative, historically important, or that come to be important in the study of the art and visual culture of the photograph. AHL indexes scholarly articles, book chapters, dissertations, and book reviews on U.S. and Canadian history from prehistory to the present. Search HA for the history of the rest of the world (databases can be searched together). Both databases include many articles on the history, impact, and uses of photography. Coverage: 1964 to the present. Abstracts of journal articles, books, essays, exhibition catalogs, PhD dissertations, and exhibition reviews. Covers modern and contemporary arts from the late 19th century onwards. Includes photography since its invention; is a particularly rich source for articles on all aspects of the study of photography as fine art, material artifact, documentary object. Coverage is from 1960 to the present. These powerful databases, collectively called "Web of Science," can be searched separately or together. They index an impressive number and range of journals and the indexing goes back further than almost any other periodical database. Web of Science can be used to do two things: 1) the databases can be searched by keyword/author/title/etc., as with any other database, and 2) they can be used to trace ideas forward in time by seeing how seminal articles and books are cited, something not possible in any other kind of search. The citation-search feature is tricky to learn but amply repays the learning curve. Use AHCI to find material on photography as an art and in the arts; use SSCI to find material on photography as it might be written about or used in any of the Social Sciences disciplines; and use SCI to find material on the science and technology of photography and on how photography is written about or used in science and medicine. Coverage: AHCI: 1975 - present. SSCI and SCI: 1900 - present. Index to Masters' theses and PhD dissertations in all subject areas, granted by North American, British, and some European universities. Dissertations added after 1997 are frequently available as full-text. Included are many dissertations on photography and photographers. Coverage: 1861 to the present. Abstracts from 1980. Citation index to articles in astronomy, biology, chemistry, geosciences, health sciences, mathematics, medicine, nutrition and physics. Includes journals in English, French, German, and Spanish. Some links to full-text. A good source for articles on as well as including photography in many disciplines, as well as on the technical and scientific aspects of photography. Coverage: 1984 to the present. Index to “nearly all” art journals published in the United States between 1840 and 1907. Each issue is indexed completely, including articles, art notes, illustrations, stories, poems, and advertisements. Includes articles on photography as an art and as a science. Full text of core journals in all disciplines, especially math, general science, social sciences, religion, language and philosophy. JSTOR is a historical collection, covering from the inception of each journal to 1-5 years ago depending on the rights agreements for each title. Coverage of photography is both broad, across many disciplines, and deep, spanning a long period of time. The interconnections between literature and photography are deep and rich. MLA indexes journals, dissertations, conference proceedings, and monographs in the field of language, literature, linguistics, and folklore. Includes coverage of performing arts literature, and is a good source for material on film studies. Coverage is 1963 - present. Full-text journals published by major university presses, especially journals in the humanities and social sciences. Provides access to a wealth of articles and books on photography as it is covered by and used in many different disciplines in the humanities and social sciences. Citation index to a wide variety of U.S. and Canadian general-interest periodicals and popular, non-technical magazines, a rich source of American cultural history covering more than a century. Find articles and reviews from such publications as Critic, Century, Harper’s, The Nation, and International Studio. Citation index to English-language journals in the fields of anthropology, corrections, economics, gender studies, gerontology, minority studies, political sciences, psychology, and sociology (among others). Some links to full-text. A good source both for articles on and articles that include photography in many different disciplines. Coverage: 1983 to the present. Boni, Albert, editor. Photographic Literature, 1960–1970: An International Bibliographic Guide to General & Specialized Literature on Photographic Processes, Techniques, Theory, Chemistry, Physics, Apparatus, Materials & Applications, Industry, History, Biography, Aesthetics, etc. Hastings-on-Hudson, NY: Morgan & Morgan, 1972. Essential reference work that includes publications of all types, dating from 1727; many entries are annotated. Primarily technical, but includes useful sections on individual photographers, bibliography, history, aesthetics, and illustrated books as well as photographic processes. Author indexes. Heidtmann, Frank. Bibliographie der Photographie Deutschsprachige Publikationen der Jahre 1839-1984 = Bibliography of German-Language Photographic Publications 1839-1984. Second revised and enlarged ed. K.G. Saur: Munchen, London, NY, Paris, 1989. "A more or less complete national bibliography of photographic literature," intended as an aid for researchers, journalists, photo historians, collectors of photographs, professional and amateur photographers, and all others interested in photography and its literature. Organization is a heirarchical classification scheme of five major sections - General, Technology, On Photography (theory and composition), Visual, and Company Publications (e.g. Busch, Canon, Zeiss) - with sub-classifications within these divisions. Does not list individual periodical articles. Indexes by personal names, classification terms, and title key words. Johnson, William S., editor. An Index to Articles on Photography. Rochester, NY: Visual Studies Workshop, 1977-78. Continued by the International Photography Index (below). Subject index to several dozen periodicals. Subject headings include "by artist," "by city or country," collection, etc. ———. International Photography Index. Boston, MA: G.K. Hall, 1983 -. Continues An Index to Articles on Photography (above). Koelzer, Walter, Editor. Bibliographie der Photo-und-Film-Zeitschriften, 1840-1940 = Bibliography of photographic and cinematic journals, 1840-1940 = Bibliographie des periodiques photo-cinema, 1840-1940. Dusseldorf, Foto Brell, 1992. Alphabetical listing of 2,000+ international periodicals with information on language, country of origin, publication dates, frequency, holding libraries, and sources consulted. Publications in the UK, US, Belgium, Germany, France, and Russia are well represented; publications of Southeastern Europe, Spain, Portugal, and Latin America less so due to lack of available information. Annotations when included are trilingual. Indexes include periodical country of origin, personal and corporate name, sources consulted, and holding library symbols.Koelzer, Walter, Editor. Bibliographie der Photo-und-Film-Zeitschriften, 1840-1940 = Bibliography of photographic and cinematic journals, 1840-1940 = Bibliographie des periodiques photo-cinema, 1840-1940. Dusseldorf, Foto Brell, 1992. Photography. Modern Art Bibliographical Series, volume 2. Oxford; Santa Barbara, CA: Clio Press, 1982. Contains annotated entries from ArtBibliographies Modern for articles on photography published between 1972 and 1979. Emphasis is on the artistic rather than the scientific side of photography, but much information can be found on cameras, equipment, and the technical development of photography, particularly during the 19th century. No distinction is made between art photography and industrial, documentary, or applied photography. A general section conains material on general or worldwide photography, followed by a section arranged alphabetically by country. Sennett, Robert S. The Nineteenth-Century Photographic Press: A Study Guide. NY; London: Garland Publishing, 1987. Provides historians and scholars of photography "some access to the wealth of material published in journals between 1840 and the end of the century." Begins with a brief but useful essay on the birth of and the nature of the photographic press. Lists in alphabetical order "every European and American journal which could be construed as being relevant to photography;" several have been studied issue by issue for several years and citations made to important contributions.